Irven G. "Pete" Reynolds Jr.- Pete is the son of dealership founder Irven G. Reynolds, and joined the company in 1950 after serving in the Navy in WWII and graduating from Mount San Antonio College. He assumed ownership in 1958 and began looking for ways to promote the business. He met Buick Rep. Bill Trevor while attending dealer meetings at the GM Training Center in Burbank, CA, and the two developed a rapport. Bill remarked to Pete on several occasions that if Pete wanted to sponsor a car, Bill knew of the right driver to sponsor. It was Bill that introduced Pete to "Pop" Kennedy. Pete began providing Pop with dealership owned racing cars beginning with a red 1959 Invicta coupe, a car remembered today as the "winningest Buick of all time." Lennie "Pop" Kennedy- Pop Kennedy was a weekend warrior, working for Freightliner Truck during the week and racing on the weekends. He was older than many of the other drivers, being well into his forties at the time, but usually came away with the win. He raced several Buicks beginning with a 1955 Century, and caught the eye of Bill Trevor who said he had the fastest reflexes of any racing driver he had ever met. Bill facilitated the meeting of Pop and Pete, and the rest is history. Their affiliation lasted from 1959 through 1972, when Pop decided to retire from driving. He formed Kenne-Bell racing with engine tuner Jim Bell and remained active in Buick motorsports after he retired from driving. Jim Bell was a drag racer in Southern California who often raced against "Pop" Kennedy, then recognizing the significance of Pop's talent, decided to team up with him instead. Jim's proposal: "I'll tune the cars, and you drive them". 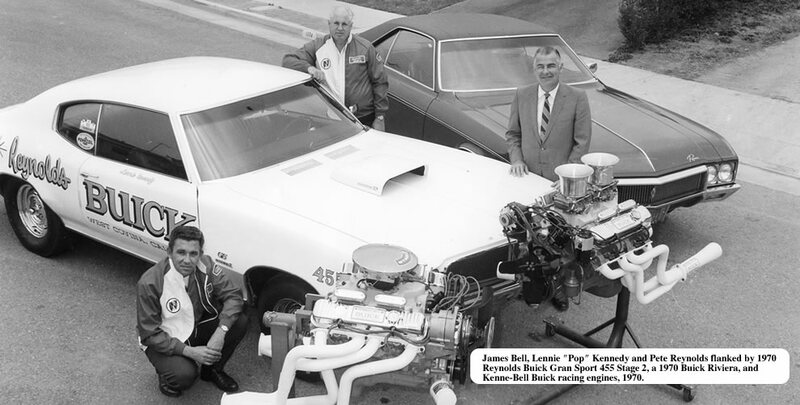 Their association reached a new plateau in 1968 when they formed Kenne-Bell racing, dedicated to developing high performance Buick raging engines. Still in business, the firm changed its focus to producing Mustang performance parts after Buick exited the high performance market in 1987. Bill Trevor was an Buick Technical Instructor at the General Motors Training Center in Burbank and a passionate drag racing enthusiast. It was Trevor who suggested to Pete Reynolds that if we wanted to sponsor a car, he had the driver. As the association blossomed, Trevor was the unseen wind that sailed the ship- the coordinator of three talented individuals locally and an invaluable help serving as a vital link to Buick engineering in Flint. It is through Trevor that the Stage 2 Program could be field tested while complying with the corporate ban on racing. His fondness for Red Gran Sport coupes with white tops and four speed transmissions is legendary, as several of the specially ordered "Bill Trevor demos" have survived. Dennis Manner was a project engineer at Buick Engineering in Flint. It was his idea to develop a performance options for the new big block engines that debuted in 1967. Working in conjunction with Bill Trevor, Dennis provided experimental components to Trevor to be tested in the Reynolds cars. Dennis is the father of the Stage 1 "Fast for the Street" and Stage 2 racing engines and provided all of the prototype Stage 2 parts to Reynolds for testing. He went so far as to develop a specification sheet for a proposed Stage 2 factory drag car, but it was not approved for production as the era of high-compression was fast drawing to a close.